My brother asked me for a yellow squash recipe, so I said I'd just blog my favorite. 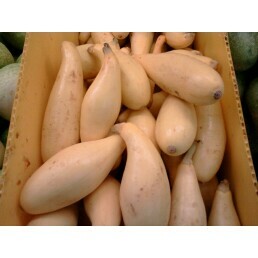 There are many varieties of summer squash, and they are harvested from early summer through fall. The following recipe is my version of a recipe shared with me by my baby nurse. Yes, I had a baby nurse for a couple of weeks after my first was born! I quoted Prissy from Gone with the Wind: "I don't know nothin' 'bout birthin' no babies" (nor taking care of them). All right, I also had her after my second was born; apparently "givin' birth" affected my memory for taking care of a newborn. 1. Heat oven to 350 degrees. Wash the squash, slice into about 1/2" slices and boil in water until tender (or until a fork is easily inserted). Drain the squash very well in a colander. Using a heavy-duty mixer with a large bowl, mix the squash and onion with the butter, salt, pepper and nutmeg. Add the eggs, cheese and 1/2 c. crackers*. 2. Spray a shallow, approximate 9 x 1 1/2 (nine by one and one-half) inches round oven-to-table cookware dish with a butter-flavored cooking spray. Pour the squash mixture into the cookware. Top with the remaining 1 c. crushed crackers* and bake approximately 35-40 minutes or until the topping is golden brown. Enjoy! My Storage Cabinet: It happens every time, never fails - After dinner with my daughter recently, I started to reach for the perfect container and lid to store a leftover in the fridge; and I found myself pulling everything out. "As usual," some pieces just fell on me. Well, "as usual," this was the last time this was going to happen to me! 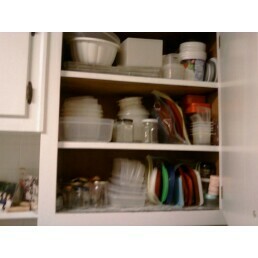 I proceeded to reorganize the whole cabinet, "as usual." This project took me at least 45 minutes! You see, I'm a confessed (somewhat neat) pack rat. My daughter and her (neat) husband bought me a whole new set of containers hoping I would toss my cream cheese containers, jars, etc. However, you see, I really do need all this to send things home with people. My rule is that if it doesn't fit in the cabinet, I don't keep it. That cabinet sure is getting tight though. Guess who shows up at Thanksgiving with all the containers for taking home leftovers? I love working with squash. There are so many things you can make. This is a great concept and obviously, good timing to share.